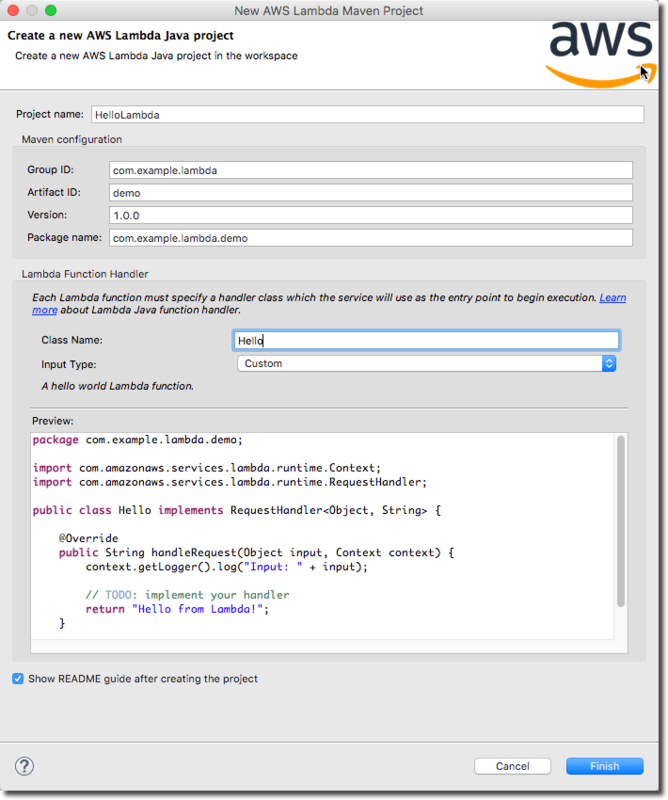 This tutorial guides you through the process of a typical AWS Lambda workflow, and provides you with first-hand experience using Lambda with the AWS Toolkit for Eclipse. The tutorial assumes that you have an AWS account, have already installed the AWS Toolkit for Eclipse, and that you understand the basic concepts and features of Lambda. If you're unfamiliar with Lambda, learn more at the Lambda home page and in the AWS Lambda Developer Guide. To begin a Lambda project, you first implement the code as a method in a handler class. The AWS Toolkit for Eclipse provides a new project wizard to help you create a new handler class. The Lambda project is a Maven project that uses a POM.xml file to manage package dependencies. You can use the Maven command line tool for building, testing, and deploying your application. For more information about Maven, see the Maven project documentation. On the Eclipse toolbar, open the Amazon Web Services menu (identified by the AWS homepage icon), and then choose New AWS Lambda Java project. Or on the Eclipse menu bar, choose File, New, AWS Lambda Java Project. The Package Name field is the package namespace for the AWS Lambda handler class. The default value for this field is a concatination of the Group ID and Artifact ID, following Maven project conventions. This field is automatically updated when the Group ID and Artifact ID fields are updated. For Input Type, choose Custom. For information about each of the available input types, see New AWS Lambda Java Project Dialog. Verify that your entries look like the following screenshot (modify them if they are not), and then choose Finish. As you type, the code in the Source preview changes to reflect the changes you make in the dialog box. After you choose Finish, your project's directory and source files are generated in your Eclipse workspace. A new web browser window opens, displaying README.html (which was created for you in your project's root directory). README.html provides instructions to guide you through the next steps of implementing, testing, uploading, and invoking your new Lambda function. Read through it to gain some familiarity with the steps that are described here. Next, you implement the function in the HelloLambda Java project that was just created for you in Eclipse. 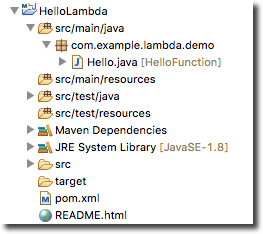 In the Eclipse Project Explorer, open Hello.java in the HelloLambda project. It will contain code similar to the following. Replace the contents of the handleRequest function with the following code. For Lambda to be able to access your Lambda function, you have to create an IAM role that gives it access to your AWS resources. You can create the role in two ways, either through the AWS Management Console or by using the AWS Toolkit for Eclipse. This section describes how to create the IAM role in the console. See Upload the Code to create one using the AWS Toolkit for Eclipse. From the Services menu, open the IAM console. In the Navigation pane, choose Roles, and then choose Create role. For Select type of trusted entity, choose AWS service, and then choose Lambda for the service that will use this role. Then choose Next: Permissions. For Attach permissions policy, choose AWSLambdaBasicExecutionRole. This allows Lambda to write to your CloudWatch Logs resources. Then choose Next: Review. Add a name for your role, such as hello-lambda-role, and a description for the role. Then choose Create role to finish creating the IAM role. AWS Lambda requires an Amazon S3 bucket to store your Java project when you upload it. You can either use a bucket that already exists in the AWS Region in which you'll run your code, or you can create a new one specifically for Lambda to use (recommended). You can create an Amazon S3 bucket in two ways, either through the AWS Management Console or by using the AWS Toolkit for Eclipse. This section describes how to create an Amazon S3 bucket in the console. See Upload the Code to create one using the AWS Toolkit for Eclipse. From the Services menu, open the S3 console. Enter a bucket name, and then choose a region for your bucket. This region should be the same one in which you intend to run your Lambda function. For a list of regions supported by Lambda see Regions and Endpoints in the Amazon Web Services General Reference. Choose Create to finish creating your bucket. Next, you upload your code to AWS Lambda in preparation for invoking it using the AWS Management Console. Right-click in your Eclipse code window, choose AWS Lambda, and then choose Upload function to AWS Lambda. 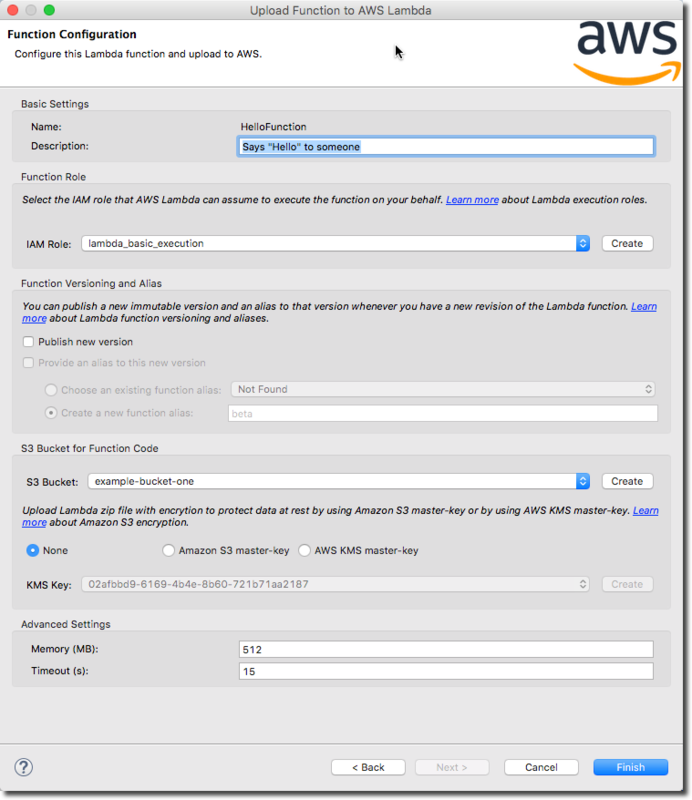 On the Select Target Lambda Function page, choose the AWS Region to use. This should be the same region that you chose for your Amazon S3 bucket. Choose Create a new Lambda function, and then type a name for your function (for example, HelloFunction). On the Function Configuration page, enter a description for your target Lambda function, and then choose the IAM role and Amazon S3 bucket that your function will use. 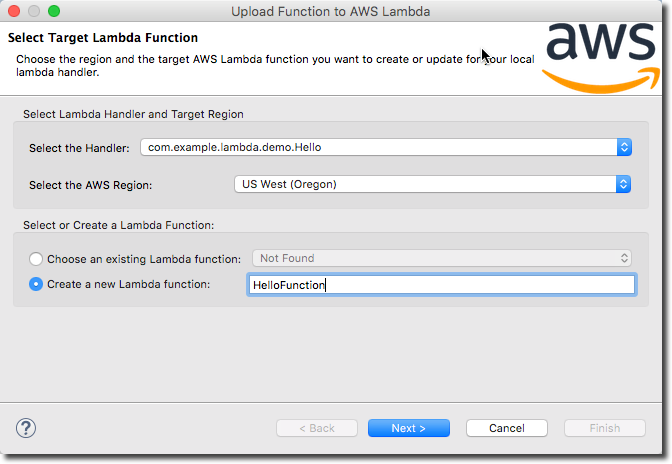 For more information about the available options, see Upload Function to AWS Lambda Dialog Box. On the Function Configuration page, choose Create in Function Role if you want to create a new IAM role for your Lambda function. Enter a role name in the dialogue box the Create Role dialogue box. On the Function Configuration page, choose Publish new version if you want the upload to create a new version of the Lambda function. To learn more about versioning and aliases in Lambda, see AWS Lambda Function Versioning and Aliases in the AWS Lambda Developer Guide. If you chose to publish a new version, the Provide an alias to this new version option is enabled. Choose this option if you want to associate an alias with this version of the Lambda function. On the Function Configuration page, choose Create in the S3 Bucket for Function Code section if you want to create a new Amazon S3 bucket for your Lambda function. Enter a bucket name in the Create Bucket dialogue box. In the S3 Bucket for Function Code section, you can also choose to encrypt the uploaded code. For this example, leave None selected. To learn more about Amazon S3 encryption, see Protecting Data Using Server-Side Encryption in the Amazon S3 Developer Guide. Leave the Advanced Settings options as they are. The AWS Toolkit for Eclipse selects default values for you. Choose Finish to upload your Lambda function to AWS. If the upload succeeds, you will see the Lambda function name that you chose appear next to your Java handler class in the Project Explorer view. If you don't see this happen, open the Eclipse Error Log view. Lambda writes information about failures to upload or run your function to this error log so you can debug them. 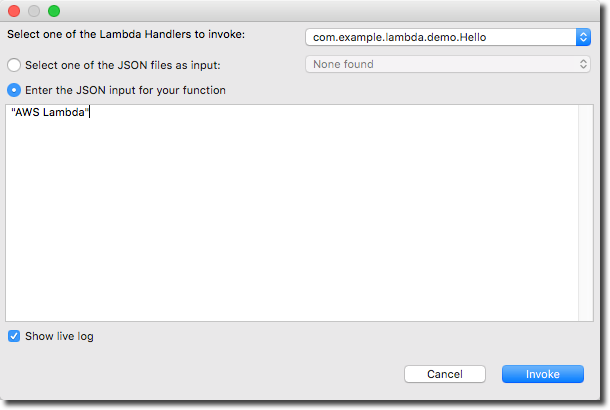 You can now invoke the function on AWS Lambda. Right-click in the Eclipse code window, choose AWS Lambda, and then choose Run Function on AWS Lambda. Choose the handler class you want to invoke. In the input box, type a valid JSON string, such as "AWS Lambda". You can add new JSON input files to your project, and they will show up in this dialog box if the file name ends with .json. You can use this feature to provide standard input files for your Lambda functions. The Show Live Log box is checked by default. This displays the logs from the Lambda function output in the Eclipse Console. Choose Invoke to send your input data to your Lambda function. If you have set up everything correctly, you should see the return value of your function printed out in the Eclipse Console view (which automatically appears if it isn't already shown). Congratulations, you've just run your first Lambda function directly from the Eclipse IDE! Now that you've uploaded and deployed your function, try changing the code and rerunning the function. Lambda automatically reuploads and invokes the function for you, and prints output to the Eclipse Console. For more information about each of the pages that were covered in this tutorial, as well as a full description of each option, see the AWS Lambda Interface Reference. For more information about Lambda and about writing Java code for Lambda, see Authoring Lambda Functions in Java in the AWS Lambda Developer Guide.